The excess weight of the stored files has the potential to compromise the structural integrity of the sixth floor of the facility," said the Inspector General report. "We noticed floors bowing under the excess weight to the extent that the tops of file cabinets were noticeably unlevel throughout the storage area. 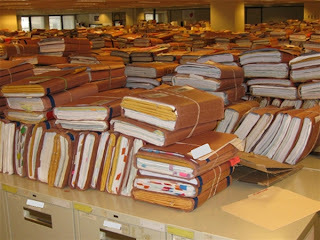 Concretely (ahem) the files exceed the floor's capacity by 39 lbs/ sq.ft. Can't wait 'til ALL our medical care gets the same excellent service the government has been providing our Veterans!